CHRISMATION: The Continuing Journey is a two-year process of preparation for the conferral of Confirmation on the youth of the Diocese of Palm Beach, which reflects a vision of Chrismation as the lifelong, continuing journey of faith begun at Baptism. 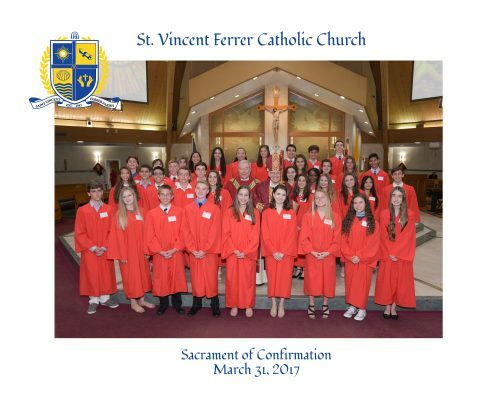 In the parish of St. Vincent Ferrer, this two-year process will be brought to fruition through involvement of a variety of ministries, namely: catechesis, youth ministry, liturgy, sponsorship, hospitality and service. This two-year process begins in the 8th Grade (Cycle I) and continues into the 9th Grade (Cycle II), with the Sacrament of Confirmation being conferred upon the candidates at the successful completion of both Cycles. All students who will be entering the 8th Grade are eligible to enroll in Cycle I to begin the process. All candidates will participate in both Cycle I and Cycle II. Please Note: If a student is entering the 8th Grade at St. Vincent Ferrer School, they do not have to be enrolled until they complete the 8th Grade year at the school. If they should leave the school at any time during that school year, they should enroll in the parish Cycle I Program. Parents must be registered in the parish. Proof of Baptism and First Communion. (Even if they received the sacraments at St. Vincent Ferrer, please bring the documents at the time of registration, so that accurate information can be recorded for the records). Registration Fee: $100.00 (individual) or $150.00 (family). Tuition will increase $15.00 in each category on September 1st. ALL OF THE ABOVE MENTIONED ITEMS NEED TO BE SUBMITTED AT THE TIME OF REGISTRATION IN ORDER FOR THE REGISTRATION TO BE COMPLETE. Classes will be held on Sunday mornings from 11:15 AM to 12:30 PM. In addition to class attendance, students in the 8th and 9th grades will be required to attend 3 sessions of LifeTeen during the semester. The LifeTeen session will be in lieu of the class that day. All students will have a Service Journal to complete by the end of Cycle I. They will be assigned Masses where they will have an opportunity to assist in a variety of ways. Students will complete Cycle I with a spiritual retreat, along with the Cycle I students from St. Vincent Ferrer School, as both groups have demonstrated that they are ready to move on to Cycle II by their attendance, preparation, desire, and service. Cycle II Fee is $160.00 (individual) or $220 (family). Tuition will increase $15.00 in each category on September 1st. The online registration form is available here. Once submitted, the form will automatically link to complete payment online with a credit card; otherwise, cash and checks can be dropped off at the parish office during regular business hours. If you have any questions, please feel free to contact Deacon Frank Iovine at (561) 279-8041, or via email at ReligiousEd@stvincentferrer.com. Confirmation is Scheduled for Friday, April 5th, 2018 at 5 pm. Click HERE to download the 2018-19 CONFIRMATION Calendar! A sponsor is to be a witness, an inspiration, and an example of how a Catholic should live in today’s world. They are entrusted with the responsibility to be an active participant in the life of the Church and the person they are sponsoring. This means proclaiming their faith through their actions and the life they lead each and every day. Through their personal witness of prayer, active attendance at weekly Mass, and living the Gospel values, they pass the Catholic faith on to others. In this light, a sponsor must be an active, practicing Catholic who has been Baptized and Confirmed. The required qualifications of a sponsor are stated in Church Law and it is the duty of the pastor to verify their eligibility. Most parishes, therefore, provide a specific form for this purpose (Click HERE to download the Sacrament Sponsor Form). It is the obligation of the parish where the sponsor is registered, to verify that they are both an active and practicing Catholic. If the sponsor is not personally known by the pastor, he may need evidence to support that a sponsor is living a life of faith. This is usually provided by reviewing records and other verifiable sources such as involvement in parish ministries, volunteer time at various parish functions and offertory envelopes to verify weekly attendance at Mass. Please do not assume that a parish will automatically provide a letter without the ability to confirm a sponsor’s attendance, support, and participation.